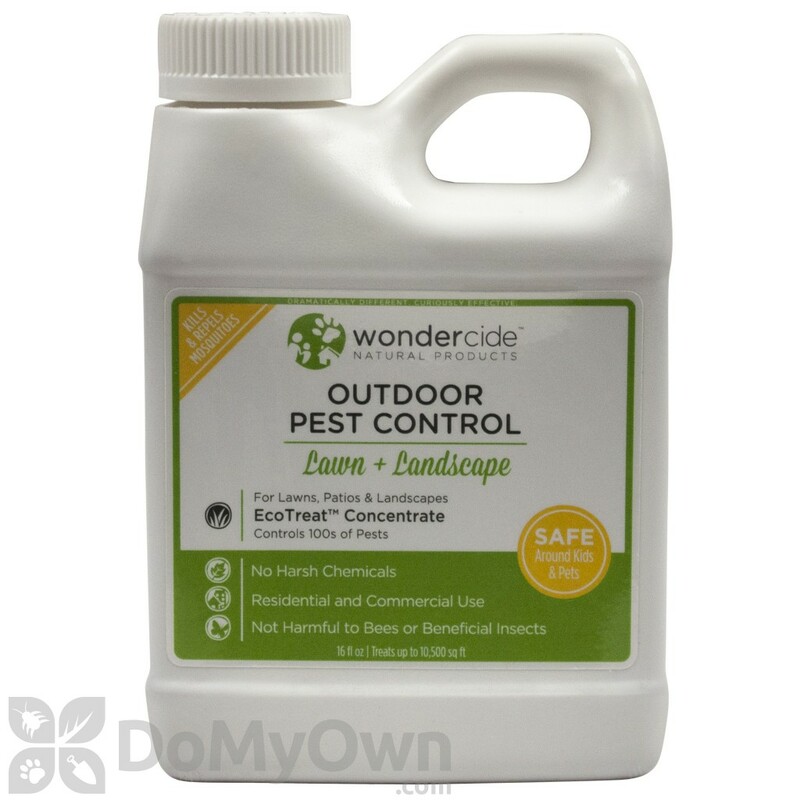 Wondercide Outdoor Pest Control - Lawn and Landscape previously known as EcoTreat - Natural Outdoor Insect Control is a water soluble concentrate made for outdoor pest control applications. 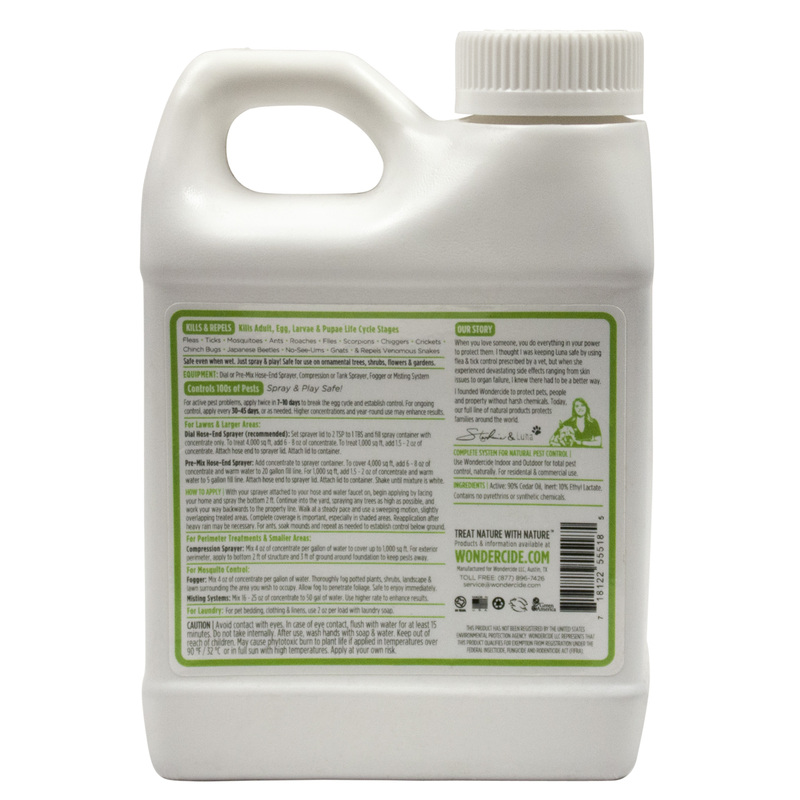 This is a powerful, yet natural formula that is a safe alternative to chemical pesticides. This is made for uses such as: golf courses, gardens, lawns, dog runs, parks, offices, warehouses, food production facilities and many more. It kills on contact and does not require a wait time or a re entry time. Great for use around babies and animals. Can also be used indoor. Available in 2 Sizes: 16 oz. and 32 oz. Our cedar oil is sourced exclusively from Texas & Virginia cedar trees. Hose-end Sprayer: 6 - 8 oz. per 20 gallons of water for 4,000 sq. ft. Treats up to 20,000 sq. 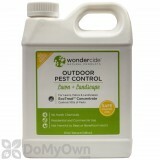 ft.
Wondercide Outdoor Pest Control - Lawn and Landscape is a bio-based alternative to common synthetic pesticides (permethrin & pyrethroids). With Wondercide Outdoor Pest Control - Lawn and Landscape and tap water, one concentrate controls hundreds of insects, spiders & venomous snakes. Stronger mixtures enhance results without damaging side effects. Dilution ratios vary by application. EcoTreat can be applied with any applicator. EcoTreat can be used inside for routine pest control without stain or residue. This can safely be used inside and outside without danger to pets, people or property. Mosquitoes, Fleas, Ticks, Ants, Chiggers, No-See-Ums, Mites, Moths, Japanese Beetles, Scorpions, Carpet Beetles, Mole Crickets, Termites, Box Elder Bugs, Silverfish, Roaches, Palmetto Bugs & Numerous other Non-Beneficial Insects. Purchased to kill No See Ums. Does not work. I highly recommend this product for use in yard. We used it throughout the summer months in our backyard and found it to provide great results. We have a partly wooded area and the mosquitos were awful. With the use of this product we could enjoy the outdoors wthout getting bitten up terribly. I used them around my rose bushes spraying only during early morning hours and my rose bushes were not consumed by pests at all. I highly recommend. I wanted to explore using an earth friendly, pet and human friendly alternative to repelling mosquitoes from our yard. I came across this product last year and I was very pleased with the results. My backyard was overrun with mosquitoes and I can say this product works very well. Bottle lasted through summer months. I just purchased my supply for this year from domyown.com they have best price. I highly recommend this product. Does this product "kill" venomous snakes, like copperheads? The EcoTreat Natural Outdoor Insect Control is primarily used for killing and controlling insects. It does provide some fungus control on lawns, and it will repel most species of snakes including copperheads but it does not kill them. Keep in mind, when using ANY repellant on an animal it may or may not work depending on how bad that animal wants to get to the other side of that irritant. Just as a dog on an electric fence knows that if he really wants that dog/cat on the other side he can get to it and just tolerate the temporary shock, any other animal can make that same decision. If actually killing the snakes is a priority to you, you may want to try Snake Traps that will catch them and allow you to dispose of them as you please. Let us know if we can be of any further assistance. I have 6 acres, I would like to treat with EcoTreat - Natural Outdoor Insect Control, how much would you recommend? You will need 14 quarts of EcoTreat - Natural Outdoor Insect Control for a one time application outdoors for 6 acres. Each quart will treat approx. 20,000 sq ft.
Is EcoTreat - Natural Outdoor Insect Control safe to use around a well? Our property uses a well for our water and I am hesitant to use many products. But, living close to Lyme, CT, ticks are a real concern! EcoTreat - Natural Outdoor Insect Control is natural and per manufacturer will not pose any threat to humans/animals. You can apply up to the perimeter of the well. What type of cedar oil (red - white - Alaskan yellow) is used in the EcoTreat - Natural Outdoor Insect Control? EcoTreat - Natural Outdoor Insect Control is made with Eastern Red Cedar Oil from Texas and Virginia. Can you spray EcoTreat on veggies? EcoTreat can be applied in vegetable gardens. Please consult the product label for application instructions.